IHOP goes with French toast and crepes topped with fresh fruit this summer with the arrival of the new, seasonal Fresh Market menu. Available for a limited time, you can choose from Fresh Strawberry & Orange or Fresh Berry Berry Banana (strawberries, blueberries, and banana slices) served over vanilla-dipped Brioche French Toast or sweet cream stuffed crepes with prices starting at $4.99 (may vary). You can also add the fresh fruit toppings to any other menu item (such as on pancakes). 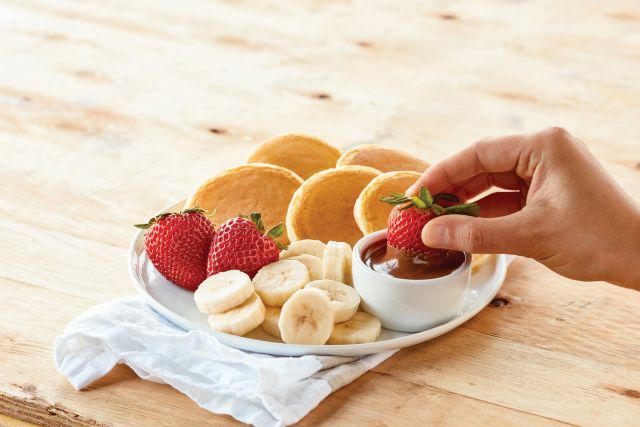 The menu also includes new Fundue, which features five Silver Dollar Buttermilk Pancakes with strawberries, sliced bananas, and Nutella for dipping. The Fresh Market menu can be found at participating locations nationwide through July 30, 2017.